Because of the scale, I can't give Run the 2.5 stars I feel it deserves, so to be fair I gave it 3. 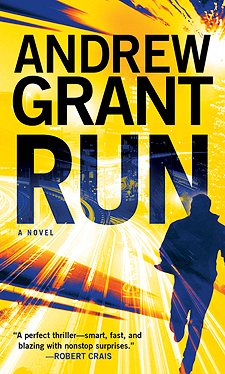 Andrew Grant is an excellent thriller writer - but he missed the mark with Run. There will be those who disagree, and that's great... that's why there are so many books available...something for everyone. This one just wasn't for me. This story is a muddled mess - I felt like I was trying to wash mud off my windshield and just as I could start to see clearly the vehicle in front of me douses me with mud again. There are so many characters, good and bad - but throughout the book everyone is in the grey zone that exists between good and bad. Even the protagonist does some "iffy" things. Trying to draw a mental image of Marc Bowman, I got a cross between, Jack Bauer because no matter how dire the situation, he is triumphant (again and again and again..etc., etc.) and "Leonard" from Big Bang...he's very smart, extremely nerdy, and has just enough social skills to land himself a wife. Whom he proclaims to be madly in love with, yet when given the opportunity to show that love, he opts to do otherwise. Again making him "iffy." There's so much going on in this book, at times it was exhausting to read. I finally got to the point I just didn't care anymore. Andrew Grant is a talented writer, he has shown us that with prior novels and has a knack for nerdy humor, which saves this book in the long Run.. I don't know what happened - Run had a solid start, but half way through it starts crumbling like day old corn bread, with bits and pieces here and there, lots of action, frantic pace and wham it is over. It seemed to me he simply tried to put too much into a short book. 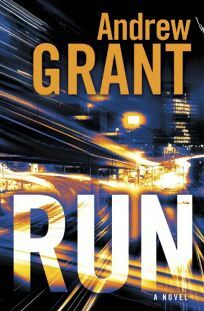 I've read Grant's work in the past and I will read it again....everyone has a "not so great book" - I hope Run is his. In a nutshell - if you like computer related thrillers and you can set reality on a shelf while you read, you should try Run...if not run, run away!